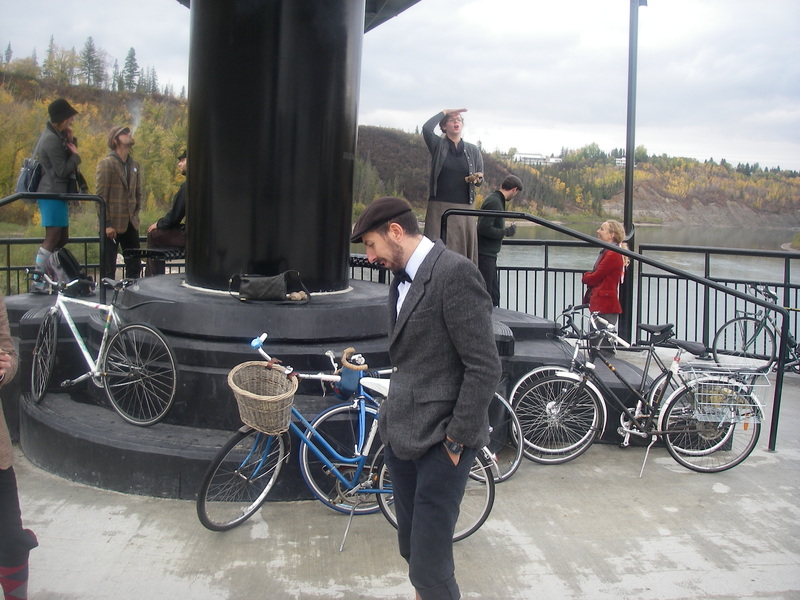 Last week I participated in the fourth Edmonton Tweed Ride. 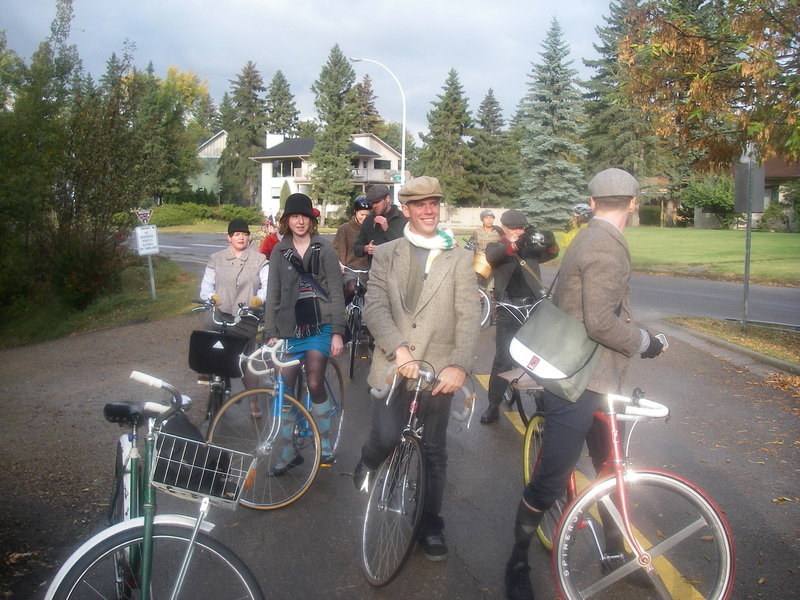 While I was aware of tweed rides elsewhere, particularly the original in London, I hadn’t known about the local one until recently. This was my first Tweeded group outing. 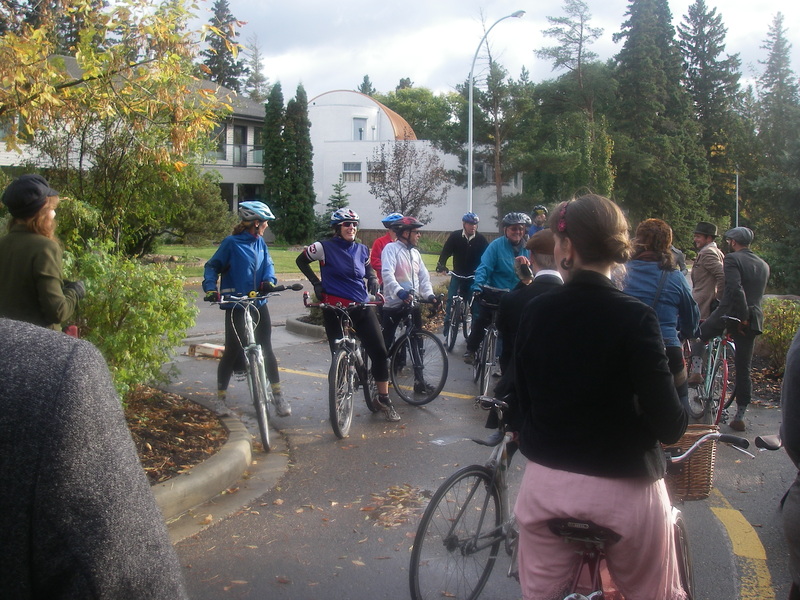 In fact, this was my first group ride of any sort as I am something of a solitary cyclist. 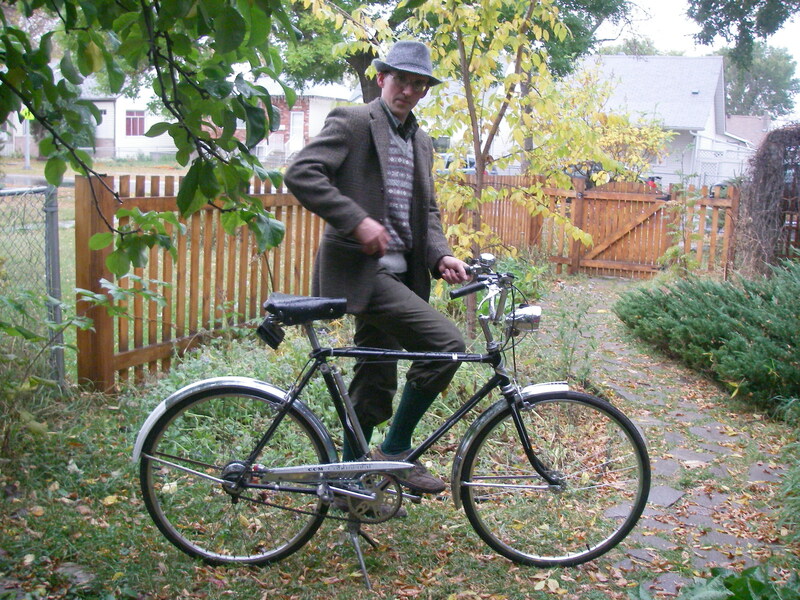 I already had a nice Harris Tweed jacket that I like a lot, some climbing pants that are a plausible substitute for plus-fours, and a nice vintage bike. The day before the ride I zipped off to Value Village in search of further articles of clothing. I found a nice pure virgin wool sweater-vest and an acceptable hat. There were no knee length argyle socks, but you can’t have everything. I did find some nice long green woolen socks that were OK. I also bought an decent bike for a very low price but I’ll save that for another blog post. 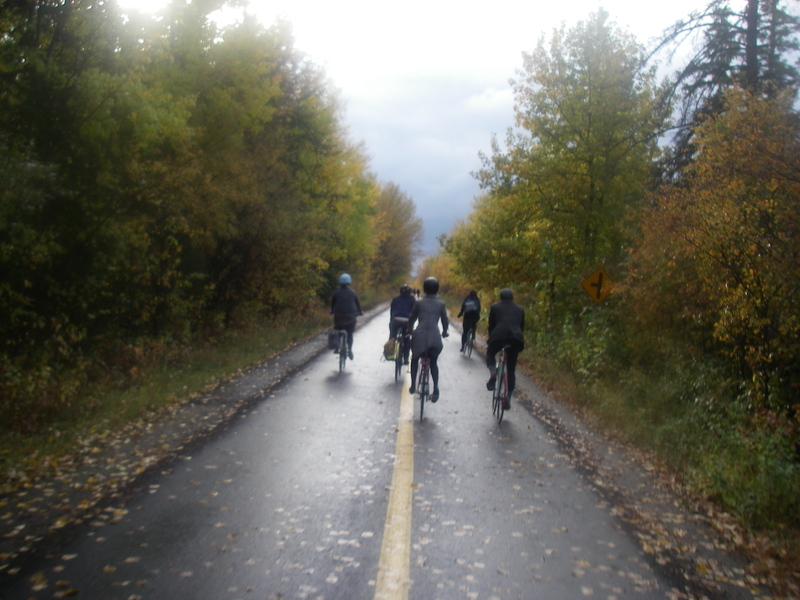 The day of the ride was grey and cool. 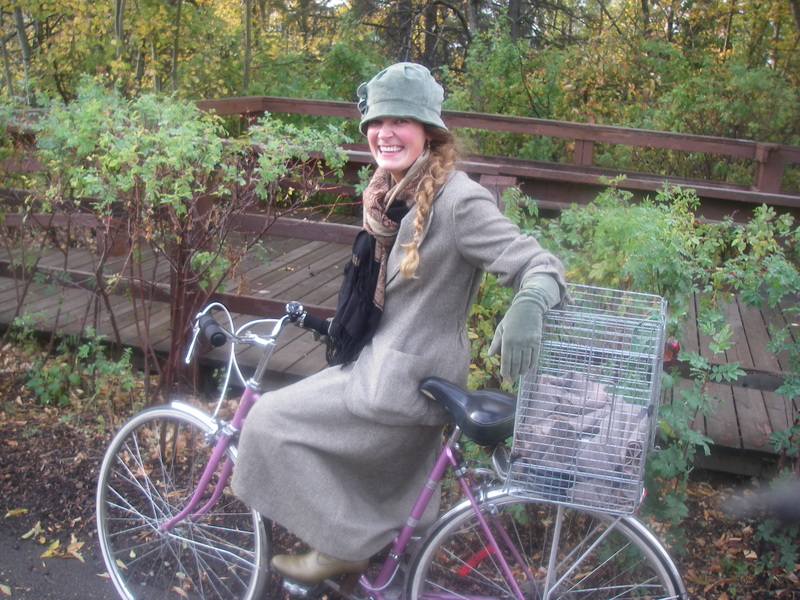 I thought this appropriate weather for cycling while wearing layers of heavy wool. 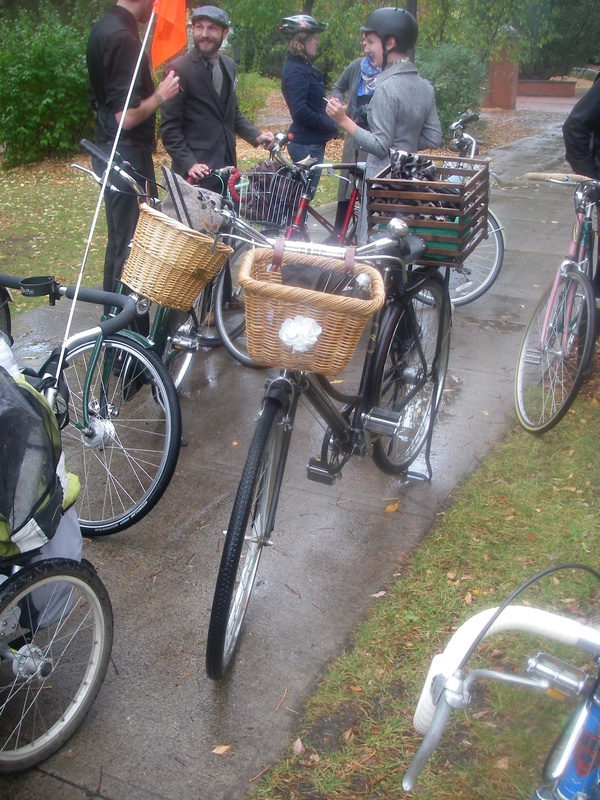 Shortly before I was to leave for the ride a steady, cold rain began to fall . How thoughtful of the ride organizers to arrange for us to have some authentic British weather. I briefly considered staying home but after putting the effort into getting the clothing together I was determined to ride. I resolutely went out the door and set off on my bike. 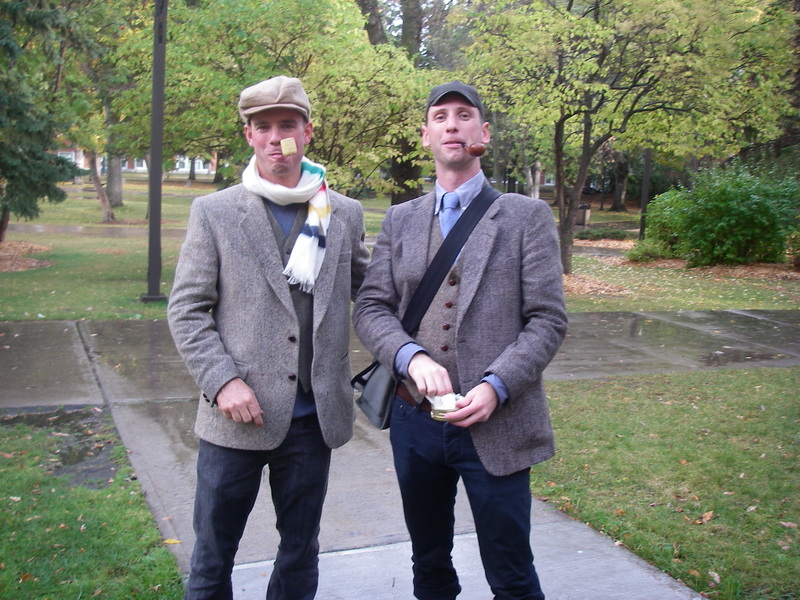 While passing through downtown I spotted two other cyclists in tweeds. I pulled up behind them and commented that they could only be headed to one place. 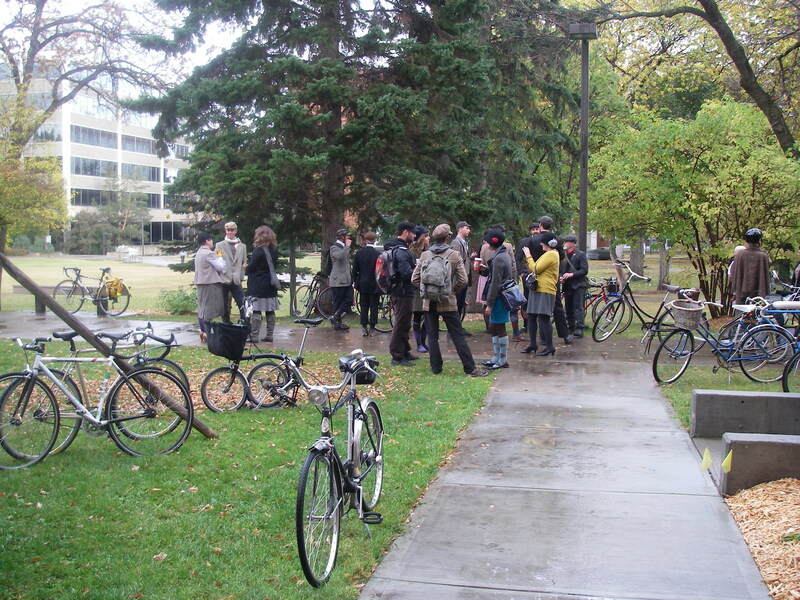 As it it turned out, I was correct and we rode together the rest of the way to the gathering point at the U of A Quad. 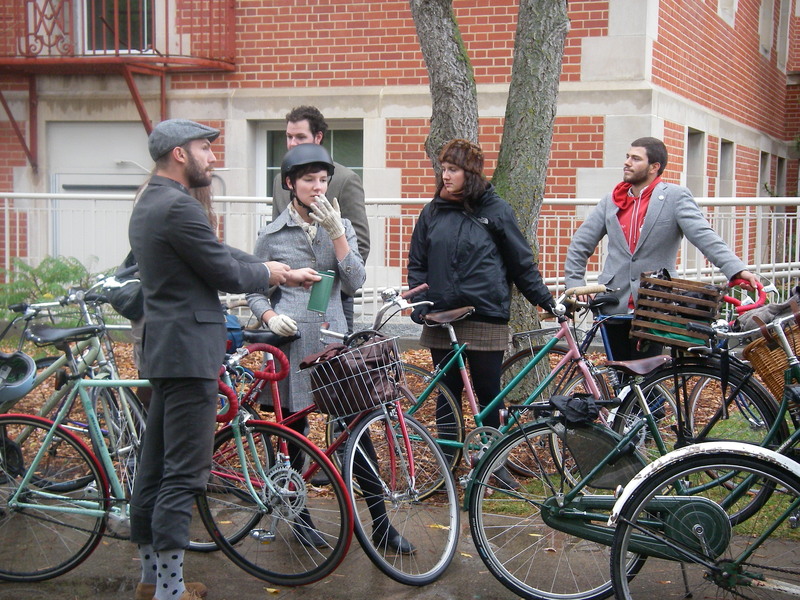 They had improvised some effective cardboard fenders for their bikes and also seemed determined to see it through. 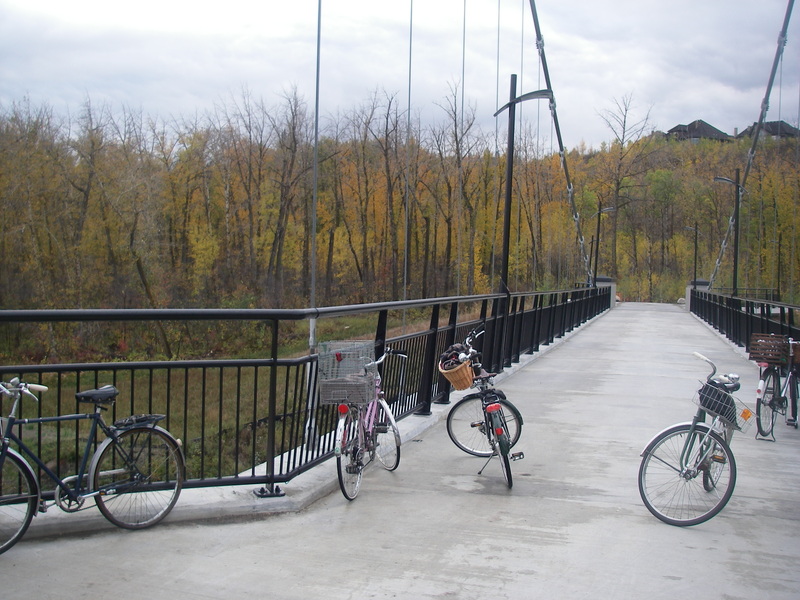 Crossing the High Level Bridge in the wind and driving rain seemed to promise a bleak ride. 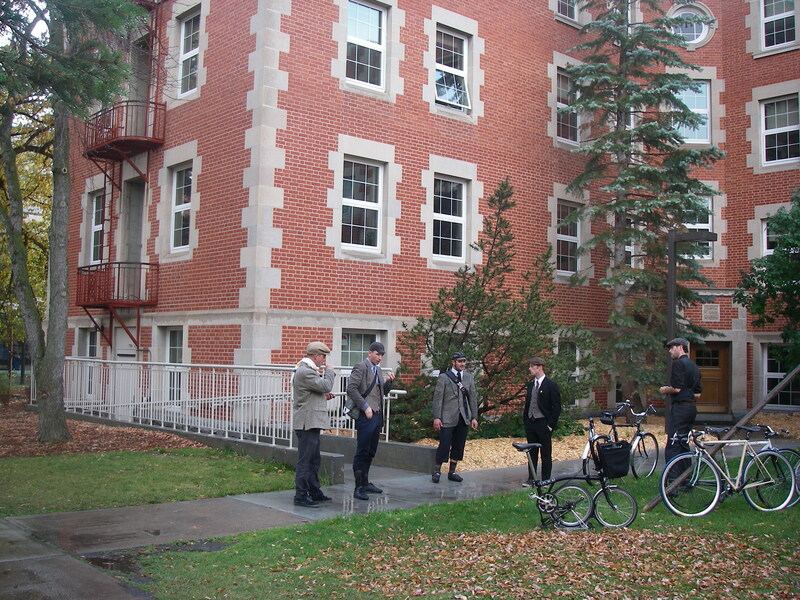 Wen we arrived at the Quad there were others already there. We milled about for quite a while waiting for late arrivals and for the route details to be finalized. While the rain stopped, it remained overcast. Flasks of booze appeared from jacket pockets. Pipes and cigars were lit. There were lovely bikes and some very nifty costumes. I was envious of the array of fine argyle socks. I met these two fellows on the way to the ride. He gets my vote for best Tweeded Man. That is also a splendid bike. The umbrella was a nice touch. 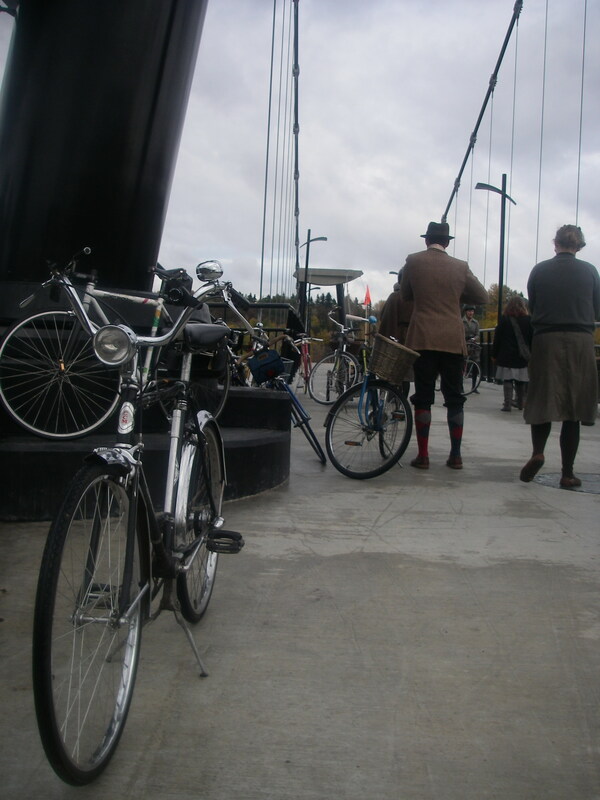 I like this Raleigh with the nifty kickstand. Eventually we were ready and embarked sedately . There was some road riding and a lot of trail riding. There was a comic moment when we encountered another group ride of road cyclists well decked out in modern sporting bike gear. We stopped for a good natured chat about temporal anomalies and anachronisms and snapped photos of each other. 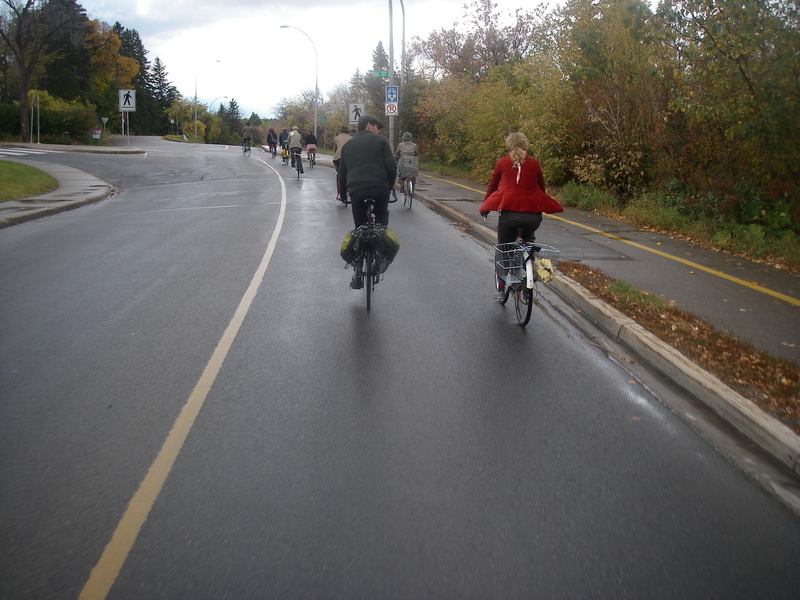 Afterwards we headed down into the river valley along a steep series of switch-backs accompanied by the sound of a multitude of squeaky brakes. While my trusty CCM Continental is a lovely bike it does not especially like to stop quickly in wet conditions. The ride down into the valley was nice but lurking behind was the specter of pedaling back up on a 3-speed bike. The wooded trails were beautiful in their Autumnal splendour. 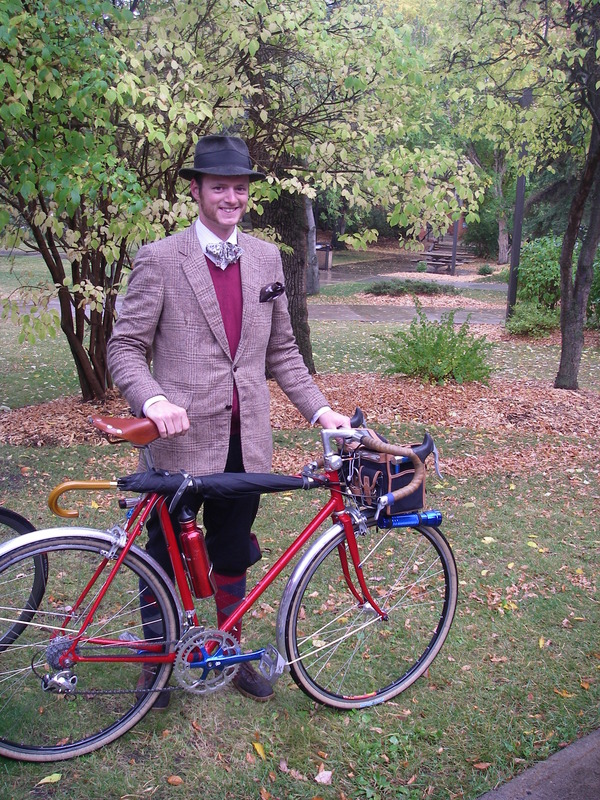 Throughout the ride I was impressed as to how comfortable and suitable the tweed was to the cycling conditions. We stopped a few times along the way as the group spread out to let every one catch up. Our destination was the new footbridge across the river. Up to that point, I was only vaguely aware of it but having seen it I was now impressed. A lovely afternoon of Autumn cycling. She is my pick for the Best Tweeded Lady. 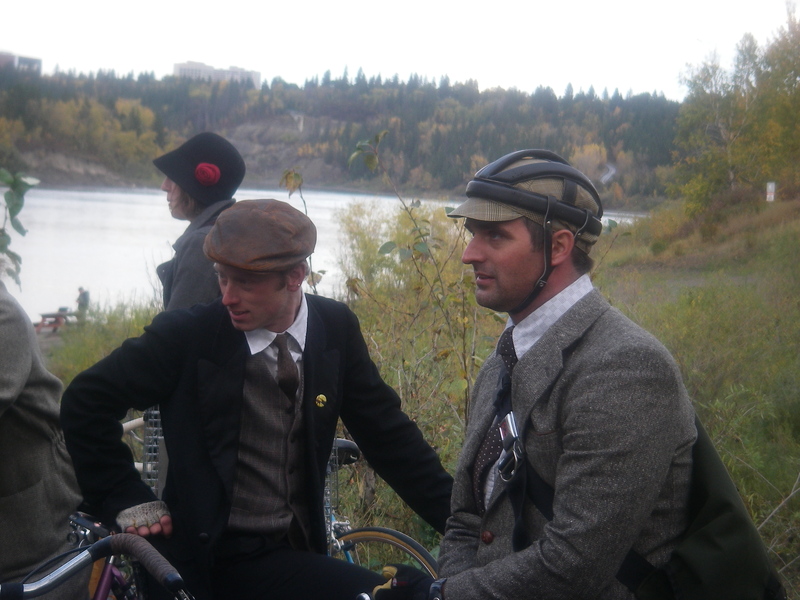 Two impeccably dressed cyclists. I particularly like the helmet. The ride back was uneventful except for a delay caused by a mechanical difficulty. Fortunately one of the riders lived nearby and was able to speed home and return with a ratchet, socket and a replacement crank nut. Riding up out of the valley was moderately strenuous on my 3-speed but I was able to complete the climb without dismounting to walk my bike. Those of us with no other previous commitments headed to the Next Act pub for well deserved food and drink. The pub staff had been forewarned but the other patrons seemed bemused by our arrival. 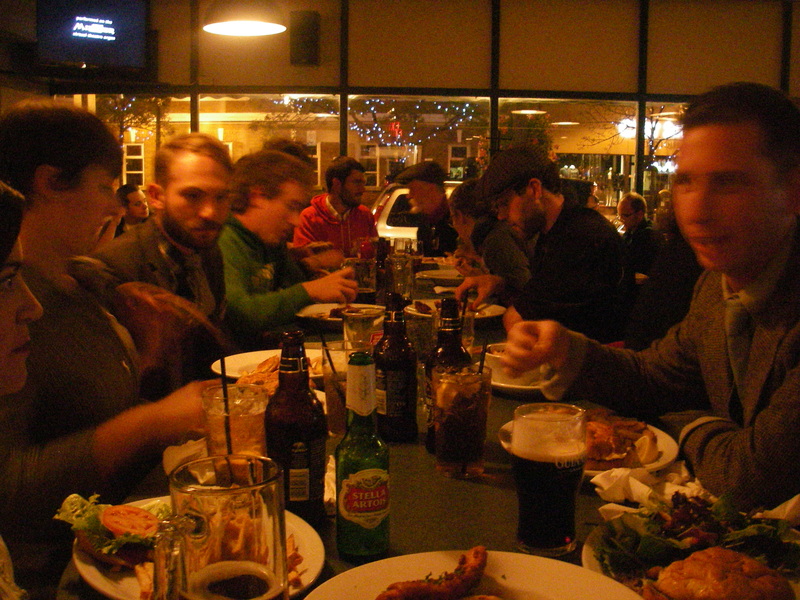 The food was good, the drinks refreshing and the pub stood us to a round of shots. Very nice. A pleasant ending to an excellent afternoon of cycling. 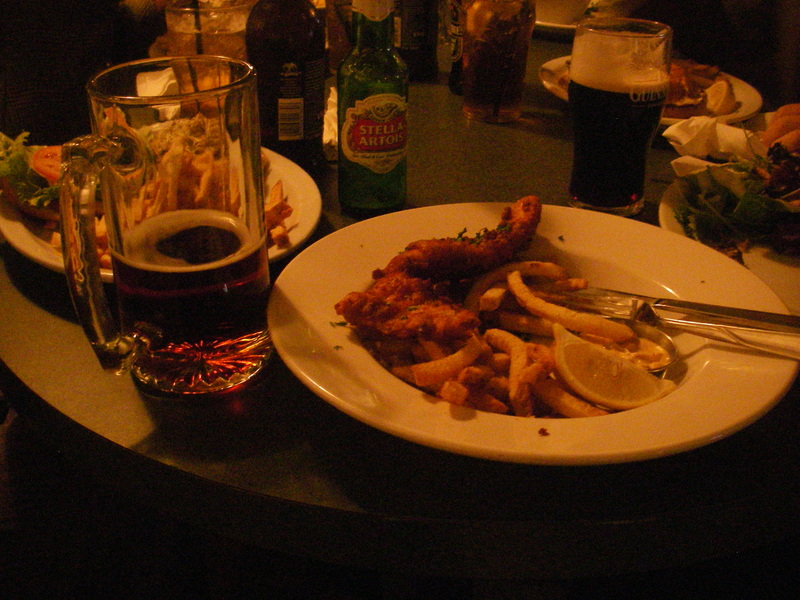 Fish and Chips (of course) and a very large mug of beer. And now, if I haven’t exhausted your patience you may want to view the video I made from the ride. It was my first trip with my new bike-cam and it performed tolerably well, I think.